Messi’s hat trick against Real Betis yesterday already has been laughed, cried, and marveled over. Around the world, response to the performance was instantly elevated to the pantheon of his finest showings by journalists and supporters. 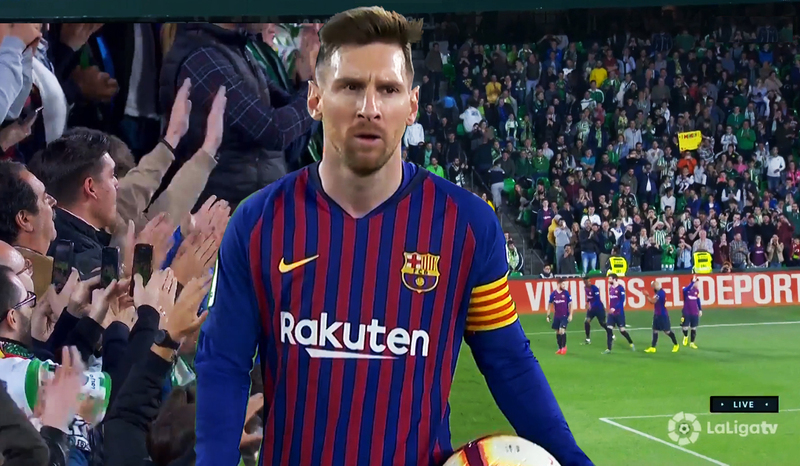 The most indelible reaction to Messi came from the Real Betis home fans at the Estadio Benito Villamarín in Sevilla. Within three minutes of Betis pulling back a consolation goal for pride to mark their own when they were already three down, Messi answered with his third. In a driving one-two he played with Rakitic to the outside left edge of the box, he dinked a volley perfectly over the outstretched pterodactyl frame of Pau López in the goal to get his third and bring the score to 4-1. “Messi! Messi!” chanted the home supporters; their green and white arms waved and bowed on St. Patrick’s day. As he celebrated, first with his two index fingers pointed skyward, and then acknowledging the reception from the opposing fans, it seemed the little man at the center of the wonder was struck with the situation. Messi made comment of the uniqueness of the reaction in his typical gracious (almost taciturn) way. After the match he said he didn’t remember rival fans applauding him before. This was the second hat trick he scored in the city of Sevilla this season. That is the first time a player has marked a city as theirs so wholly in a single season in the history of the Spanish top-flight. Messi has scored biting hat tricks before against other clubs in their ground, both recently and throughout his dominance, but those have frequently been displays of his brutal competitive nature. The hat tricks away at Madrid have been the deepest biting wounds he’s inflicted on rivals. Yesterday was the first game in La Liga after the Champions League quarter finals draw against Man U was announced. It was also the last game before an international friendlies break–one which will, incidentally, see Messi’s return to the Argentina national team. In addition to their talisman, the squad would also see the majority of their lineup travel and train with their countrymen before resuming the chase for the treble. How did Barça play? Valverde dispensed with the third front attacker (Dembélé is injured, Coutinho, Malcom, and Prince were on the bench), and instead opted for a midfield of Busquets, Rakitic, Arthur, and Arturo Vidal. To call Arturo Vidal a midfielder seems to be a misnomer; he chases the ball and play all over the pitch and makes himself a designated presser of play everywhere. He also frequently does get into the box, but he is just as likely to be lending support between Alba and Arthur. Real Betis held the majority of possession, probing the midfield through William Carvalho. Betis also found some creative outlet with Lo Celso, but Barça’s defenders extinguished any fires that arose. Lenglet continued to be incisive at center back, as was the ever-assured Piqué. Likewise, Arthur showed defensive intelligence to track back and deny a clear opportunity for Betis, while he also sent more forward balls to spring attacks than he has been. Arthur has already grown through that awkward over-cautious stage that Andre Gomes never surmounted. Luis Suárez scored a world class goal in the second half that would be goal of the month in England. A darting, jinking run that beat the entire defense as he broke from midfield. Suárez played a great game, turning the heat up to disrupt the concentration of the defenders with every run. Nelson Semedo came off the bench to replace Arthur, and the right back allowed Sergi Roberto to slot into midfield. This injects the Portuguese’s speed up the wing in a way that Valverde has tried repeatedly to do this season to overwhelm opposition in the final quarter of matches. However this also can leave the back exposed, as was the case when Semedo struggled to press tightly enough to stop the shot that put Betis on the scoreboard. Coutinho came on briefly at the end and had a few cute runs and creative chances, though it was in the wake of the wave of applause the stands had just made for Messi before they started packing up to leave. The game ended 4-1. Barça lead the league by ten points over Atlético Madrid. They will return to the Estadio Benito Villamarín to play the Copa del Rey final against Valencia on May 25, the weekend before the Champions League final. As it feels today, that game will be a welcome warmup.